Fact nerd alert! I confess that I love facts. For me, facts are the jumping off points to creating story. They could be something simple like – Humans use their eyes. A dog uses its nose. 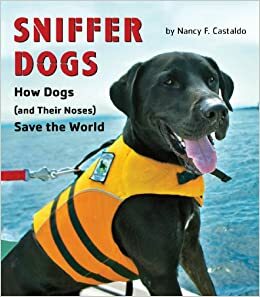 That fact will lead to questions and questions help flesh out the story – in this case the story of sniffer dogs. This sentence begins to expand that fact into a scene by introducing character and setting. Let’s take another look at that section. Now I’ve introduced other senses into the scene, which gives the reader a stronger experience. These techniques are also used for fiction writing. Take a look at how the writer incorporates theses techniques on the page of any narrative nonfiction. Today’s assignment: Expand one of the basic facts below into a scene using character, setting, and perhaps dialogue (must be authentic for nonfiction! ). Keep in mind that there are many other techniques to use – for example, suspense. Don’t be afraid to do a little research. Write on! Fact #1 Deciduous trees lose their leaves in the fall. Fact #2 Journalist Nellie Bly raced around the world. Feel free to share a paragraph or two of today’s writing in the comments if you’d like! Thanks, Nancy. I love facts too, but your exercise to expand the basic, isn’t as easy as it appears. Simply great exercise! Thanks, Mona. Keep in mind, campers, that nonfiction takes many forms. Don’t hesitate to craft your exercise into verse, memoir, biography, or picture book text! I thank God that the park is closed on Sundays in the Fall. I sneak out of the broken window of our bedroom and head to the river. I want to pick up the search where we left off last night. Campfire smoke and the smell of bacon hang low in the fog this morning. “Burr, I should have grabbed a sweatshirt,” I scold myself. Typical me, jump right in with no forethought to the consequences. The river seems to have stopped chasing its current this morning. A glass like surface reflects the eerily beautiful fall colors. Red, yellow, and orange leaves cling to their branches, standing guard along the river. “JAMIE!” I scream, shattering the silence. I spin around waiting for an answer. The only response–an orange, maple leaf slowly flutters down to the glass surface of the river. Slow ripples spread out along the surface as I collapse to the ground. So very vivid! I love the momentum of your piece. Love the tension and suspense! Keep it up! Talk about setting mood! The solitariness of that single leaf, and this single person calling out are magnified in that beautifully crafted line. So descriptive and emotional. My favorite line is, “The river seems to have stopped chasing its current this morning.” That paired with the fact the character is wondering where the search team is gives it a lonely somewhat hopeless feel. Palm trees. Please. What was the big deal about a bunch of tall, skinny trees? They had nothing on her lush, leaf-covered oaks and maples at home in Michigan. Will I ever fit in? Lila wondered as she slumped in the sun on her back porch. It was September. Her parents had timed the move so she could start the school year on time at beautiful-sounding Ocean View Junior High. But here she was at three weeks into the year and nothing felt right. Gazing at the palm tree reaching across the neighbor’s stucco fence, she thought bitterly, deciduous trees lose their leaves in the fall; what can these things do? She longed for her friends, her home, and especially the comfort of fall and watching the scene shift from greens to oranges, reds, and yellows – a predictable pattern. In her new life, she had no idea what was to come. The analogy here contributes so much to the development of character. Comparing the predictability of her old setting to the unknown of the new was a clever way to incorporate facts that establish a sense of place and a clue about this character’s troubles. I love this! You have a great voice and I like how you showed her desire for predictability and something familiar in a strange place. Wonderful way of incorporating a fact into a fiction piece! This piece captured the way I felt the year my parents moved us from Indiana to Florida in September my Sophmore year. I thought no one could capture that feeling, but you have done it completely. Loved it. I did some research about deciduous trees and came up with this today. Thanks for the inspiration! Just a second here, trees have hormones? Hormones. No other word has more airplay in my house lately. One perimenopausal mom plus one pubescent teen equals a lot of hormones! And let’s face it, they get a bad wrap. Hormones cause grumpy scowls and moody outbursts about basically nothing. Hormones cause zits and bloating and periods that always seem to come at the most inconvenient times. They cause hot flashes and cold looks where once there were warm hugs. But trees have hormones figured out. They know how to use them. When times get stressful out in the forest, like a drought or cold winter coming, a tree’s hormones help protect it. Tree hormones signal the tree, “Hey! You better start getting rid of some things, simplify your life, prepare to shut things down for a while until conditions improve.” Then they stop producing chlorophyll and the leaves shut down, showing off the other colours in their leaves, the ones they have been saving for the grand finale, before finally taking that final bow and letting the leaves fall to the ground. Then they rest and they wait until the day when the stress passes and the conditions are right to start again. LOL such a fun use of this fact! Menopause and trees! You never know where research takes you! Go with it! LOL! That is a funny line. What a fun way to compare your characters. It really brought the humor out in this scene. We’ve got raging hormones in our house too. Great way to link to the trees. Funny too. Just echoing the love!! Trees and hormones. Who knew? I had super fun with this assignment. I actually used your exact fact in my free write (fiction). I hope that is okay? I have run races on fell, or alpine, running courses. It is truly invigorating, but I have never written about it. Thank you for the writing prompt. I may use it as an example with my sixth graders. With the final turn less than a kilometer away; a feeling of euphoria overcomes me. No pounding feet behind me. No heavy breathing either. I’m alone on the trail with the final climb ahead of me. Coach said that fell running was going to test my stamina, fortitude, and endurance, but I had no idea that I would feel jubilation. The biggest difference between fell running and cross-country running is the hills are unmarked and the courses are longer. This must be a runner’s high. As I approach the top of the final hill, a mist from the morning fog, which has lifted, tickles my face. The final turn is tighter than I expected, so I hug the right side of the trail and peer down the hillside that I just climbed. Is that the chase pack at the bottom? I’m getting away and the finish line should be only a few hundred meters after those final trees in the distance. Wait a minute. Is this the trail? The new-fallen leaves are covering the trail. I think. Deciduous trees lose their leaves in the fall. It must be the oak trees that surround me. Maybe I’m on the wrong path. “Finish strong, Patrick,” someone yells from up ahead and the panic instantly subsides. It sounds like Mom. I’m on the right trail. I exit the trees and the finish line is closer than I thought. As I break the tape, my heart is pounding out of my chest and tears are forming in my eyes. I’ve qualified for the Fell Running World Championships in Scotland. How interesting to have used the character’s knowledge of the fact as a way to show disorientation, questioning whether it was the right trail. Then “Mom’s” voice as a beacon on the other side of the trees is a beautiful way to resolve that tension. This is exactly what I was thinking. Glad you mentioned it. I love how many of you have chosen to incorporate facts into your fiction. I presented a workshop on research for fiction at the last New England SCBWI conference. It is an extremely useful tool to have in your writing toolbox. Research should not be limited to nonfiction. Keep going! Could be a section of a middle grades novel. Write on! I am working on poetry this summer, so I wrote a poem about Nellie Bly starting out on her journey around the world. I like the rhythm and repetition of your poem. It evokes the tedium that Nellie had to endure, using the competition of 80 days to propell her forward. Nice! The rhythm and repetition really worked for me, too. It shows the Nelly Bly’s determination and competitive spirit. If this were a picture book, I would share it with my third grade students as part of our biography unit! Love. Love. Love. You have done a wonderful job of getting into Nellie! Of course you know she makes it in 72! YAY, Nellie! YAY, Davila! And BTW, take a look at how author/poet Jeannine Atkins uses verse in her biographies. I think you’ll love her books! This is beautiful. Rhythmic. Love the repetition; it reminds me of waves. Because of recent news I find it hard to concentrate on this assignment. So I hope you will forgive me for posting what I did write because this is what I needed to put on paper. Last night I went to bed sad. I had heard the news and watched the video. I read the heartbreaking posts of a friend who is struggling with how to best prepare and protect her sons as they grow older, two of which are on the autism spectrum and might not “comply” at first to a given order. I don’t know how to help her. This morning, after hearing of yet another killing, I am angry. What is going on? I have no words, just anger. I think, where is the NRA today? Why haven’t they spoken out about the right to own guns and to lawfully announce them to a police officer? Oh right, the victims weren’t white. So here I sit with anger and tears. I have anger too. You have expressed your anger and frustration so well here. “Yet another killing,” are words that I am so weary of seeing. I too am having a hard time concentrating on other things. Thanks for sharing this. We are all feeling anger today and writing is an excellent way of working through our emotions. Thanks for sharing the heartfelt and well written post! Everyone’s writing is so great! I didn’t write this as a fiction piece but I did try to make it readable? I hope? I did learn more about trees than I knew so the assignment was a win for me. Here’s my piece. Every fall, deciduous trees put on a brilliant performance. Their leaves’ colors change from green to beautiful hues of red, orange, and yellow. It’s like one last fireworks display before the cold winter months set in. This spectacle is literally a showstopper. After leaves change color, they will make one last dramatic gesture by dropping from the tree and floating gracefully to the ground. But, why must the deciduous tree shed their leaves each year while their non-deciduous friends, the evergreens, hold on to theirs? The answer lies in the leaves themselves. Deciduous trees have broad, flat leaves. During the winter months, the air turns cold and dry. If a deciduous tree kept its leaves year round, the entire tree would suffer because it would lose moisture through the leaves and dry out. To keep the tree healthy over the winter, the leaves fall, and the trunk and branches of the tree holds on to the tree’s moisture. This helps the tree save energy during the dark, cold winter. When the weather begins to warm up again in the spring, the bare tree wakes up from its winter rest! Green leaves sprout from branches ready to make their debut. All summer, they take in light from the sun and grow into a grand canopy of leaves, providing us with shade on a hot day until the fall comes, and they prepare to drop again. Beautiful and informational! Great writing. I can see this as part of a middle school nf work. I enjoyed how you contrasted the deciduous trees with evergreens. Nice job! Everything is crisp in the fall. The air, the flowers, farmer’s gardens, the new school clothes kids wear, the leaves on the trees getting ready to fall, and even my lesson plans are crisp. Soon, though, like the leaves falling from the oaks, maples, poplars, and hickories, my lessons start to crumple and fall. All my planning gets altered by the students in my classes as I get to know them, their needs, and personalities. Unfortunately, my planning book goes from leafy details to barren branches as I try to be flexible for student led learning. Will my lesson plans ever turn back to flush leafy trees again? This analogy made me chuckle. How true! Everything is so crisp in the fall. When I cleaned up my classroom at the end of June, it felt very crumpled- papers, plans, and all! Love how you used this for a personal essay. And how true. I’m sure all campers can relate! Timmy, Adam and Abby were all Northern Leaves on a giant maple tree. They had been growing steadily all spring and summer, starting as a small bud in late March, growing larger, greener and more beautiful as the months went on. But a few weeks ago, the air turned cool one night, and they felt different the next morning. Suddenly, their bright green chlorophyll was wearing off. They were slowly changing color. So were their cousins in the other areas of the Maple Tree. “What a wonderful orange shade all the Southern Leaves have,” Timmy Leaf said one fall afternoon. “And the Western Leaves have such beautiful yellow highlights,” Adam Leaf complained. I loved reading this! I hope that you continue working with this idea! I loved the POV! What fun! If we can have talking rabbits and mice, why not talking leaves? Very creative. Why not explore this as a young fiction chapter book? Nancy, thank you for this challenging and helpful writing exercise. I will use it with my third graders! It’s been such fun to see the directions that others have taken with this quick-write. Inspiring and intimidating. Thanks for sharing this idea, Nancy! Love these verse posts! Kudos! The leaves crunched under our hiking boots creating a rhythmic punctuation of our breathing. This was our second annual hike through the Great Smoky Mountains. Our inaugural hike was on our honeymoon one year ago, and we were woefully ill-equipped, physically and fashionably, for the journey. We spent a year training in the scorching Texas heat, and the cooler 50 degree temperatures had nothing on our new found stamina. “What kind of trees are these?” he asked. Our crunching continued until his next words stop me dead. “Kind of like you,” he reflected. I love your dialogue! It is so natural. The connection between the deciduous trees and the character is amazing. I’m not sure if you are headed into a memoir or a ya novel, but this works for either. Nice job of incorporating facts. And, let’s face it – wasn’t the research fun? I was trying to figure out how to do this writing with dialogue and you just showed an excellent example. Great line — “You are deciduous…” I want to know what happens next! Ha! I am so selective about the posts that I think I can use or not, as I am writing to write, not with a work in progress. When I read this post I enjoyed it and it stuck in my brain. I used the line Fact #1 “Deciduous trees lose their leaves in the fall.” Somehow this line made me think how fuzzy my noticing of the passage of time is while I am living in the tropics and I wrote (and wrote). Thanks for a great quick write I can definitely use in the future. Here’s my attempt at the Nellie Bly topic. Geesh, I learned a lot putting this ditty together! Fascinating! Nellie checked the calendar in the attendant’s desk. This was either day 68, 69, or 70. She couldn’t remember exactly which. Still, she couldn’t imagine that the remainder of her trip around the world would take longer than ten more days. And that was the magic number to beat: 80. Phileas Fogg, the imaginary traveler, would have nothing on Nellie Bly, the real-life author, journalist, and now, with this endeavor, celebrity. Her victory was sure. She straightened the collar of her shirtwaist, smoothed her skirt, and slid open the rear door of the compartment. When the train rocked suddenly, she gripped the railing. The scent of Queen Anne’s lace and bluestem filled her lungs. She exhaled and smiled, feeling a growing anticipation for the next stop. If tiny Steubenville was any indication, she would likely be met with a flood of well-wishers many hundreds strong at this evening’s destination, Pittsburgh. Nice job ,Marilyn. Writing about a real person is always challenging. You’ve included lots of details to create an excellent feel for the historical period. One of my favorite parts of the writing process is the research. Nellie is a great person to research because you can read her journals. Primary sources are always the best. Thanks for your post! Happy writing! This assignment works great with a WIP. Here is my excerpt. Yvonne felt the dizziness subside and opened her eyes. What in the world had just happened? Maybe she should ask where in the world. One minute she was standing in front of the Intrepid Museum feeling dizzy. When next she opened her eyes she was standing in a forest. The trees resembled those she had seen in Central Park with the exception of the coloring. These were definitely deciduous trees. There was a smattering of color left on the trees. Most of the trees had dropped their leaves creating a multi-colored carpet under her feet. One thing was for sure, she was no longer in New York. She walked from the trees toward a street lined with small shops she saw in the distance. She recognized the German writing on the store in front of her from her German class. She spun around when she heard the words spat at her. “Vulgar Girl.” She looked at the woman with a heavy sweater wrapped around her and suddenly felt as bare as the trees she had just left. Nice writing, Sandra. I’m so glad this prompt worked for your WIP. Sounds like an intriguing story! Thanks for a terrific day, campers! I hope you all found this prompt fun and useful. Keep in mind that research is not just for nonfiction and crafting engaging nonfiction is easier when using the techniques of fiction. “Mother Nature…” I called once again wondering what was happening to me. “Yes, my dear?” her always gentle voice replied. “You are welcome, my dear,” she replied with her melodic voice. “Mother Nature, Mother Nature?” I bellowed in a panic. “Yes, my dear. You will go to sleep for the winter and save your energy for the spring when your new green leaves will grow again,” Mother Nature responded. Her voice sounded like a lullaby. The cottontail dashed through the backyard hopping through the autumnal leaves that were waiting to be raked by Pietro. The trees were nearly bare, especially after the high winds. Portia barked loudly waiting to be set free by her owner with her mind set on catching the bunny. The bluebirds screeched with excitement having no place to hide. “I was too impatient to work at the usual duties assigned women on newspapers.” Nellie Bly was becoming known as a sensationalist because of her undercover work. Her persistence and determination led to her journey around the world. She spent the night before her voyage packing her small suitcase. No one could believe that she managed to take all her necessities which included slippers, a blazer, a drinking cup, a jar of cold cream and of course three veils.. I like the idea of encouraging students to do creative writing in content areas such as science and social studies. If students can incorporate factual information in poetry or raps, for example, it’s a great way for them to “own” the material. The cool breezes rustle golden leaves that float down from the trees. This annual cycle coats the forest floor with layers that once dangled from branches but now as winter approaches leaves the skeletons bare until spring arrives. To think I almost missed these last gems! So glad I checked the site this morning! Thanks for posting, Mona and Jennifer! Nice work! I applaud you, Jennifer, for encouraging your students in such a creative way. I agree that such work will help them “own” their material. Lucky students! “Jen, seriously, look up a little and enjoy the view,” Allie said, picking her way up the trail. “A, I don’t want to trip on roots, and B, I don’t want to step in poop.” Jen continued to look down as she hiked. Jen rolled her eyes and started jogging up the trail. This is really cute! I had to chuckle…we went on a hike the other day and every time I went to point out a flower, I tripped. “Well, I guess the time will pass quickly seeing beauty like this.” Nellie breathed in deeply and filled her nostrils with the warm, moist ocean air. The clouds skipped and danced across the gray horizon, where water and sky seemed to meet and merge. “You be waiting for the Oriental?” asked the porter. His crisply-starched white jacket remained unmoved while he pointed out to the sea. “Will you stay with us, Miss?” the porter asked. “No, I just came to see the view today. Thank you, sir,” said Nellie. For some reason my post didn’t work the other day. I thought I’d try again.